To read more about gold prospecting, gold panning, gold history and cities near which gold has been found in each state, click on the links in the left-hand column of this page. Three hundred North Carolina gold mines and gold prospecting locations are shown in 34 counties on the North Carolina gold map. A 17 pound gold nugget was found in 1799 by a 12 year old boy, Conrad Reed, in a creek on the Reed farm in North Carolina. The nugget was used as a doorstop for three years. You will enjoy visiting the Reed Gold Mine, the nation’s first, at Stanfield. It has gold displays, gold mining equipment, a film, gold panning facilities and tours of the gold mine (704-721-4653). Also, see the North Carolina Minerals Museum at Spruce Pine and the Colburn Gem and Mineral Museum at Asheville. There are extensive national forests in North Carolina with beautiful streams where you may prospect and pan for gold. The national forests are shown on your gold prospecting and panning map. Some other gold nuggets found in North Carolina were: 28 pounds, 25 pounds and 15 pounds. Gold mines and prospecting locations continue on the adjoining Virginia, South Carolina and Georgia gold prospecting and panning maps. South Carolina Gold Prospecting, Gold Panning, Treasure Hunting and Rockhounding. One hundred thirty South Carolina gold mines and prospecting locations are shown in 17 counties on the South Carolina gold map. There were several operating gold mines in South Carolina in recent years. The Ridgeway Gold Mine, about 25 miles from Columbia, became one of the largest primary gold producing mines in North America. There are gold mines and gold prospecting and panning sites near Greenville, Spartanburg, Clemson, McCormick, Newberry, Greenwood, Camden, York, Rock Hill, Lancaster and Pageland. Please see the detailed list of cities on the South Carolina page of this website. Treasure hunters using metal detectors like to hunt for gold nuggets in the gold areas and hunt for old coins and jewelry at the rural schools and churches shown on the prospecting and panning maps. Gold mines and prospecting locations continue on the adjoining North Carolina and Georgia gold prospecting and panning maps. Georgia Gold Prospecting, Gold Panning, Treasure Hunting and Rockhounding. Five hundred Georgia gold mines and gold prospecting locations are shown in 37 counties on the Georgia gold map, extending from south of Atlanta to the North Carolina, South Carolina and Alabama state lines. Georgia is a wonderful state for gold prospecting, gold panning, treasure hunting and rockhounding. There was a major gold rush in 1828 at Dahlonega, Georgia. Vice President John C. Calhoun mined gold at Auraria, Georgia. Villa Rica, west of Atlanta, and just off of Interstate 20, is another Georgia gold rush town. Villa Rica is known as “The Golden City”. Visit the Dahlonega Gold Museum. It has displays of Georgia gold nuggets and gold coins minted at Dahlonega, plus a film and lectures about Georgia gold (706-864-2257). The Consolidated Gold Mine and Crisson Gold Mine at Dahlonega are open to visitors and gold panning may be done there. You will also enjoy panning for gold and gemstones at "Gold 'n Gem Grubbin" at Cleveland, Georgia. Gold mines and prospecting locations continue on the adjoining North Carolina, South Carolina and Alabama gold maps. Virginia Gold Prospecting, Gold Panning, Treasure Hunting and Rockhounding. Two hundred Virginia gold mines and gold prospecting locations are shown in 15 counties on the Virginia gold prospecting and panning map. Virginia has a long history of placer gold and lode gold mining. 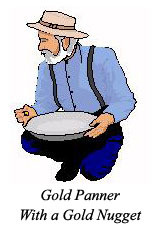 Gold prospectors from other states go to the Virginia gold mining and prospecting sites to pan, sluice, or dredge for gold. Treasure hunters use their metal detectors to hunt for gold and Civil War relics. Gold mines and prospecting locations continue on the adjoining North Carolina gold map. Alabama Gold Prospecting, Gold Panning, Treasure Hunting and Rockhounding. One hundred forty Alabama gold mines and gold prospecting locations are shown in seven counties on the Alabama gold map. Gold mining in Alabama began in the 1830's and the hobby of recreational gold prospecting and panning is enjoyed by many people today. A geological report states: “The Hilton Brothers reopened the pit. They succeeded in obtaining 65 ounces of gold from a hole 3 feet by 2 feet by 20 inches; the result of half a day’s work.” The gold mines and prospecting locations in Alabama start between Montgomery and Birmingham and run eastward. Gold mining and prospecting locations continue on the adjoining Georgia gold map (and on to Washington, D.C.). To request the popular and economical set of gold prospecting and panning maps of the Eastern States (Maps of North Carolina, South Carolina, Georgia, Virginia, and Alabama), please go to REQUESTING GOLD MAPS .